Let's just get this out of the way first. I love the Rocky films. Aside from the abysmal Rocky V, there has never been a film in the series that I haven't enjoyed. Whether that enjoyment was genuine or ironic, I've always loved these films. That being said, Ryan Coogler's Creed was by far the best since the 1976 original. 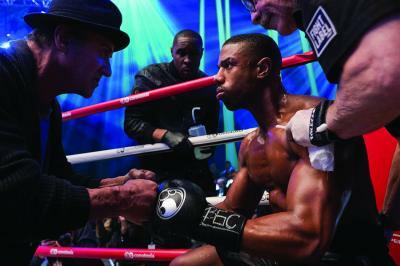 Powerful acting and Coogler's confident, energetic direction helped breathe new life into a cliched story. Creed II, however, is a totally different beast. With high melodrama, cartoonish fight scenes and a more worn-out story, it feels more like ... a Rocky sequel. However, it manages to rise above that with sheer entertainment. Since his near victory in the first film, Adonis Creed (Michael B. Jordan), under the tutelage of Rocky Balboa (Sylvester Stallone), has managed to win the heavyweight title. Unfortunately, his victory is cut short when old rival Ivan Drago (Dolph Lundgren) brings his son Viktor (Florian Munteanu) to challenge Adonis in an attempt to get some long overdue revenge against Rocky.